Home » Jesus » Did Jesus Exist? In this series of articles entitled “The Bottom-Line Guide to Jesus,” we will address various challenges to Christian beliefs about Jesus. If you already have a firm, sound belief in Jesus, these articles will help you explain your belief to others. If you have doubts or are unsure what to believe about Jesus, these articles will address some of the most common questions people ask about Jesus and offer some answers for your consideration. Durant, though not a Christian, gave a decisive Yes answer to the question of whether Jesus existed. By “the circle of Bolingbroke” Durant meant the skeptical group that included Henry St. John, First Viscount Bolingbroke (1678-1751), an English nobleman notorious for his anti-Christian views. According to Durant, then, there were private rumblings among English skeptics in the early eighteenth century about the idea that Jesus had never existed. In the past fifteen years or so, doubts about Jesus’ historical existence have picked up considerable steam thanks in large measure to the Internet. In 2015 BBC News reported that about one-fourth of British young adults ages 18 to 34 thought that Jesus “was a mythical or fictional character.” About one in eight Millennials in the United States also disbelieves that Jesus was a real person.4 Thus, as surprising as it may seem to us as Christians, the question of Jesus’ historical existence is a live issue for many people today. In this first article, we will be tackling head-on the question of whether Jesus was a real person who lived in human history. Since this is a historical question, we will be looking at the subject using historical methods of reasoning. This means that simply pointing out that the Bible says Jesus was a real man is not sufficient in this context. For Christians who believe the Bible is God’s word, of course, what it says about Jesus is true, but what we are asking here is whether there is good evidence, historically speaking, to conclude that Jesus really existed. It should also be noted that we will not be trying to defend everything that the Bible says about Jesus all at once. Instead we will focus on specific questions about Jesus one at a time and step by step explain why the evidence shows that what the Bible says about Jesus is true. In this article, for example, we are going to show that Jesus was a real person, a Jewish man of the early first century who was put to death by crucifixion by the order of Pontius Pilate. The view that Jesus never existed is commonly called Jesus mythicism, or sometimes simply mythicism.7 According to this view, the stories in the Gospels about Jesus as a human being are religious fictions, not historical fact. One aspect of the Gospel accounts of Jesus especially strikes skeptics as marking them as myth rather than history: its supernatural or miraculous elements. Jesus’ virgin birth, his miracles, and his resurrection are supposedly so obviously mythical that we should question whether he even existed. Of the many problems with this argument, the main error is beginning with the controversial aspects of the Gospel accounts instead of what historians regard as beyond reasonable doubt. Nearly all non-Christian historians have no problem agreeing that Jesus was a real person even if they doubt or deny the supernatural elements of the Gospel accounts. Thus, the historical existence of Jesus is a separate question from whether these miraculous events occurred. I discuss at greater length in another article the mythicist argument that the Gospel miracles call into question the historical existence of Jesus.9 Just keep in mind that the question of Jesus’ miracles should be addressed as a separate issue from the question of whether he existed. As one would expect, non-Christians who referred to Jesus in the late first and early second centuries did not go into great detail about his life and teachings. Their interest in Jesus was limited mainly to his part in the politics of the first-century Roman Empire. Tacitus, for example, mentioned only that Christ “suffered the extreme penalty during the reign of Tiberius at the hands of one of our procurators, Pontius Pilatus” (Annals 15.44). As Robert Van Voorst in his excellent book on the subject concludes, “the references to Jesus that we do have in major early second-century writers such as Suetonius, Tacitus, and Pliny the Younger are quite what we would expect, given the nature of historical writing and Roman views of Christianity.”12 The two facts that both Josephus and Tacitus mention are that Jesus was put to death by order of Pontius Pilate and that the Christians were so called because they followed the one they called Christ. As meager as this information is, it establishes from outside sources that Jesus lived in the early first century, that he died in Judea during the tenure of Pontius Pilate as governor there (i.e., sometimes between AD 26 and 36), that his followers regarded him as the Christ (Messiah), and that his followers were called Christians. Paul wrote his epistles between about AD 48 and 65; at least some of these epistles were written before any of the Gospels, which most scholars date to the period from the 60s to the 90s. Although Paul does not provide biographical information about Jesus, he does mention certain people and events of relevance. Paul refers to Jesus’ twelve apostles, especially Peter (whom he calls by the Aramaic form of that name, Cephas), John, and James the Lord’s brother (1 Cor. 15:5, 7; Gal. 1:8–9, 19; 2:9). His reference to James the Lord’s brother is especially difficult to explain away and is confirmed independently in both the Gospels (Matt. 13:55; Mark 6:3) and Josephus (Antiquities 20.200). Obviously, if James was the Lord’s brother, then the Lord (Paul’s customary title for Jesus) was a real man. In addition, Paul gives us in Galatians 1 a rough chronology of his conversion and early ministry that allows us to date his conversion to the early or mid-30s, agreeing with Josephus and Tacitus as to the period of time when the Christian movement began. So far we have found enough evidence from non-Christian writings and from Paul’s epistles to confirm beyond reasonable doubt that Jesus was a real historical figure, a Jewish man executed in Judea in the early 30s at the order of Pontius Pilate. We have made this case without making any appeal whatsoever to the Gospels. By no means, however, should the Gospels be ignored here, since they provide superb evidence for the existence of Jesus and fill in many details about his life, activities, and death. The fundamental question to be answered about the Gospels is simply this: What kind of books are they? For many years skeptics and liberal theologians have assumed that the Gospels are simply religious legends about Jesus intended to influence readers’ thinking and behavior but not to inform them about what Jesus really said and did. This view seemed obvious since the Gospels do not look like the typical modern biography. However, this perception has changed among Gospel scholars due to studies showing that the four Gospels belong in the genre, or literary category, of ancient Greco-Roman biography. For example, the fact that the Gospels focus almost entirely on the last few years of Jesus’ life, and largely on the last week, is consistent with Greco-Roman biographies, which are often similarly “lop-sided” in their emphasis on one period of their subjects’ lives.16 The fact that they are biographies does not by itself prove that everything in the Gospels is true, but it does mean that dismissing them in their entirety as religious fiction is unjustifiable. Details about the life of Jesus continue to be understandably controversial, but there is no legitimate basis for questioning whether Jesus existed. Again, this is the assessment of scholars across a wide spectrum of religious and non-religious beliefs. 1. Will Durant, Caesar and Christ: A History of Roman Civilization and of Christianity from their Beginnings to A.D. 325, The Story of Civilization: Part III (New York: Simon & Schuster, 1944), 553. 2. John P. Meier, A Marginal Jew: Rethinking the Historical Jesus, Volume One: The Roots of the Problem and the Person. Garden City, NY: Doubleday—Anchor Books, 1991), 68. 3. Robert E. Van Voorst, Jesus Outside the New Testament: An Introduction to the Ancient Evidence (Grand Rapids: Eerdmans, 2000), 6. 4. “Jesus ‘not a real person’ many believe,” BBC News, Oct. 31, 2015. “What Do Americans Believe about Jesus? 5 Popular Beliefs,” Barna.com, April 1, 2015. Belief that Jesus was a real human person goes up steadily with age, suggesting that the idea that Jesus did not exist is one that may become increasingly common in the future. 5. This is a very simplified description of criteria that philosophers have identified as relevant to determining the best explanation for a set of evidence. The classic study on the subject is C. Behan McCullagh, Justifying Historical Descriptions (Cambridge: Cambridge University Press, 1984), especially 19–28. 6. For discussions of various Christian approaches to history, see Kenneth D. Boa and Robert M. Bowman Jr., Faith Has Its Reasons: Integrative Approaches to Defending the Christian Faith, 2nd ed. (Downers Grove, IL: IVP Academic, 2005). 7. Two recent books representative of this point of view are Robert M. Price, The Christ-Myth Theory and Its Problems (Austin, TX: American Atheist Press, 2011); and Richard Carrier, On the Historicity of Jesus: Why We Might Have Reason for Doubt (Sheffield, UK: Sheffield Academic Press, 2014). 8. 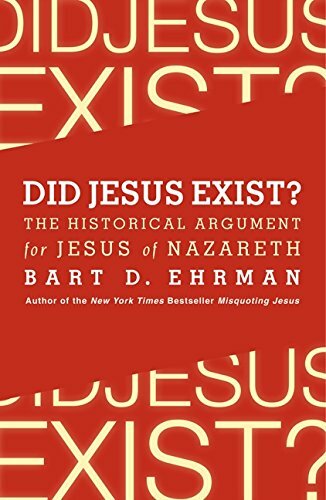 Bart D. Ehrman, Did Jesus Exist? The Historical Argument for Jesus of Nazareth (New York: HarperOne, 2012), 4. 9. Robert M. Bowman Jr., “Myths, Miracles, and the Historical Jesus” (Cedar Springs, MI: Institute for Religious Research, 2017). 10. See, for example, F. F. Bruce, Jesus and Christian Origins outside the New Testament (Grand Rapids: Eerdmans, 1974), 19–65; Van Voorst, Jesus outside the New Testament; Ehrman, Did Jesus Exist, 35–68. 11. Robert M. Bowman Jr., “Tacitus, Suetonius, and the Historical Jesus” (Cedar Springs, MI: Institute for Religious Research, 2017). 12. Van Voorst, Jesus outside the New Testament, 71. 13. Representative works arguing this point include Carrier, On the Historicity of Jesus, 514-28; Thomas S. Verenna, “Born under the Law: Intertextuality and the Question of the Historicity of the Figure of Jesus in Paul’s Epistles,” in ‘Is This Not the Carpenter?’ The Question of the Historicity of the Figure of Jesus, edited by Thomas L. Thompson and Thomas S. Verenna, Copenhagen International Seminar (Sheffield, UK: Equinox, 2012; Durham, UK: Acumen, 2013), 131–59. For a response to Verenna, see Neil Godfrey, “Was Paul’s Jesus an Historical Figure?—‘Is This Not the Carpenter?’ ch. 8,” Vridar (blog), Sept. 30, 2012. 14. On Paul’s teaching about the preexistence of Christ, see Robert M. Bowman Jr. and J. Ed Komoszewski, Putting Jesus in His Place: The Case for the Deity of Christ (Grand Rapids: Kregel, 1997), 81–84, 88–90. 15. For discussions from varying perspectives demonstrating that Paul definitely attested to an historical, earthly Jesus, see, for example, James D. G. Dunn, “Jesus Tradition in Paul,” in Studying the Historical Jesus: Evaluations of the State of Current Research, edited by Bruce Chilton and Craig A. Evans (Leiden: Brill, 1994), 155–78; Paul R. Eddy and Gregory A. Boyd, The Jesus Legend: A Case for the Historical Reliability of the Synoptic Jesus Tradition (Grand Rapids: Baker Academic, 2007), 201–233; Paul Barnett, Finding the Historical Christ: After Jesus, Volume 3 (Grand Rapids: Eerdmans, 2009), 176–209; Michael Labahn, “The Non-Synoptic Jesus: An Introduction to John, Paul, Thomas, and Other Outsiders of the Jesus Quest,” and David Wenham, “Jesus Tradition in the Letters of the New Testament,” in Handbook for the Study of the Historical Jesus, Volume 3: The Historical Jesus, edited by Tom Holmén and Stanley E. Porter (Leiden: Brill, 2011), 1936–51 (1933–96), 2041–57; Mogens Müller, “Paul: The Oldest Witness to the Historical Jesus,” in Is This Not the Carpenter, edited by Thompson and Verenna, 117–29; Ehrman, Did Jesus Exist, 117–74; Casey, Jesus, chapters 5-6. 16. See especially Richard A. Burridge, What are the Gospels? A Comparison with Graeco-Roman Biography, 2nd ed. (Grand Rapids: Eerdmans; Dearborn, MI: Dove Booksellers, 2004). 17. E.g., Craig S. Keener, The Historical Jesus of the Gospels (Grand Rapids: Eerdmans, 2009); Darrell L. Bock and Robert L. Webb, eds., Key Events in the Life of the Historical Jesus: A Collaborative Exploration of Context and Coherence (Grand Rapids: Eerdmans, 2010). 18. Rudolf Bultmann, Jesus and the Word, 2nd ed. (New York: Charles Scribner’s Sons, 1958), 13. 19. Joseph Klausner, From Jesus to Paul, trans. William F. Stinespring (New York: Macmillan; London: G. Allen & Unwin, 1943), 107. 20. Michael Grant, Jesus: An Historian’s Review of the Gospels (New York: Simon & Schuster, 1992), 200. Grant’s quotation is from Stephen Neill, What We Know about Jesus (Grand Rapids: Eerdmans, 1972), 45. 21. F. F. Bruce, The New Testament Documents: Are They Reliable? 5th rev. ed. (Downers Grove, IL: InterVarsity Press, 1960), 119.